It is C.S. Forester month at the Sheffield Hallam Popular Fiction Reading Group, and I have been reading (with considerable pleasure) the first Hornblower novel, The Happy Return (1937), but also re-reading The General (1936), Forester’s brilliant fictionalisation of the Liddell Hart view of the Great War and its military leadership. Reading the two novels together, what surprised me was how much Curzon has in common with Hornblower. Both books are about men who have to wear the mask of command, who have to seem as though they know what they are doing when they take decisions that may costly the lives of many others. Both men are self-made men, socially uncertain and knowing that their success depends entirely on how well they impress their superiors. Both have considerable personal courage and work untiringly in their country’s cause. Both have tremendous determination, and get things done. Hornblower was always able (rather against his will) to do what most of his officers failed to do – he saw his men not as topmen or hands, but as what they had been before the press caught them, stevedores, wherry men, porters. Hornblower is repelled by the navy’s brutal punishments, but when one of his officers orders a flogging, he sees it carried through, so that he does not undermine the officer’s authority. The mask has to be kept in place, and it is not always comfortable. But where Hornblower represents the thinking and feeling sailor, Curzon is the unthinking (and too often unfeeling) soldier. In his case there is not much mind behind the mask. He has little of Hornblower’s sensitivity, and less of his intelligence and tactical ingenuity. With a deep lack of imagination, Curzon keeps sending men into unwinnable battles because that is what he is expected to do. Like any military leader, Hornblower accepts that any success comes at the expense of the ‘butcher’s bill’ – the casualty list – but he tries to minimise it; Curzon has few such qualms; his promotions come at the expense of the soldiers whose lives he has wasted through his dogmatic sticking to outdated principles. He is as deeply committed to the traditions of the Army as Hornblower is to those of the navy, but his is an unintelligent traditionalism. He is a cavalryman who has no faith in advances in new military technology like the tank and the aeroplane. The General has been continuously in print for eighty years, and has set the template for many later versions of the Great War. One of its fans was Hitler, who presented special copies to his generals, to show them how hide-bound British soldiers were, and also, presumably to encourage them to be the opposite. During the Second World War, Lord Haw-Haw read extracts from the book over the radio as part of his campaign to demoralise Britain (presumably with the message that British generals this time were no different from the last). So this is a classic of the futility-of-war genre. Curzon pushes his men through the early disasters of the War, through the slogging-matches of the Somme and Passchendaele, till he is wounded while making a fruitless gesture to encourage his men on during the great German offensive of 1918. This means that the novel does not deal with the final months of the War, the last hundred days when the British Army was moving the Germans backwards with new tactics that effectively co-ordinated infantry, tanks and aircraft. Hitler always claimed that the German Army remained unbeaten, but the 1918 campaigns showed the Germans that this was a war they could not hope to win. Forester’s version of history decides to leave that out, as do many later ones, such as Oh What a Lovely War. 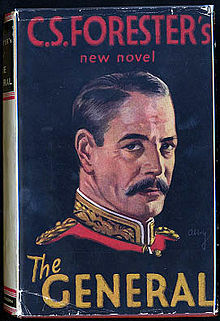 I quarrel with its presentation of the War, but it’s a brilliantly-written novel, with the same historical convincingness as the Hornblower series (Liddell Hart helped Forester with military detail, I gather). Curzon is more than a caricature; Forster displays his flaws very clearly, but also shows his virtues – personal courage and utter dedication – so that the reader does not merely condemn him. His awkward late-blooming love for Emily also arouses our sympathy. He’s a three-dimensional character, and one that sticks in the mind. He smiles his old-maidish smile at his friends, and his friends are pleased with that distinction, although he plays such bad bridge and is a little inclined to irascibility when the east wind blows. Bridge is a game of strategy, risk-taking and deception; Hornblower’s skills at the card-table parallel his ability in sea-battles, while Curzon’s tactical hopelessness is maybe what you’d expect from someone who doesn’t know when he should lead with a weak card. Forester himself was apparently an excellent bridge player; he was also a tricky person to deal with, by all accounts – someone who knew a lot about wearing a mask. This entry was written by George Simmers and posted on July 10, 2015 at 10:38 am and filed under History, Military, novels with tags C.S.Forester, Hornblower, Liddell Hart, The General. Bookmark the permalink. Follow any comments here with the RSS feed for this post. Post a comment or leave a trackback: Trackback URL. My father-in-law loves Forrester. I believe I purchased everything on-line for him that the author wrote! Thanks for this. I had heard of John Forester’s account of his father as ‘as an unloving, faithless, moneyhungry liar’, but hadn’t realised that it was available in an affordable edition. Clearly John felt a lot of resentment about his father. How trustworthy is his account? Bridge – in any form – wasn’t invented until the late nineteenth century. If I remember rightly, Hornblower was a devotee of whist. You’re right.It is indeed whist that Hornblower plays. Thanks for setting me right.